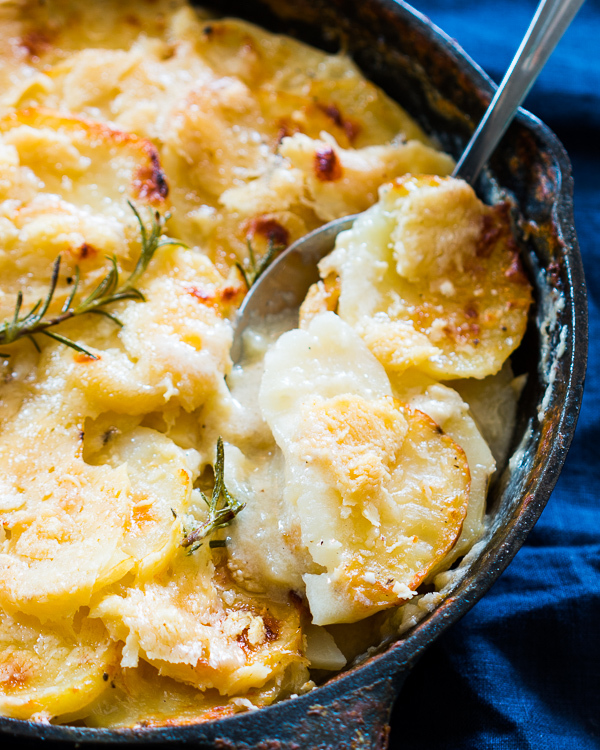 The easiest, creamiest and best ever rosemary potato au gratin recipe you will find. Perfect for holidays, important occasions and when you have guests over! 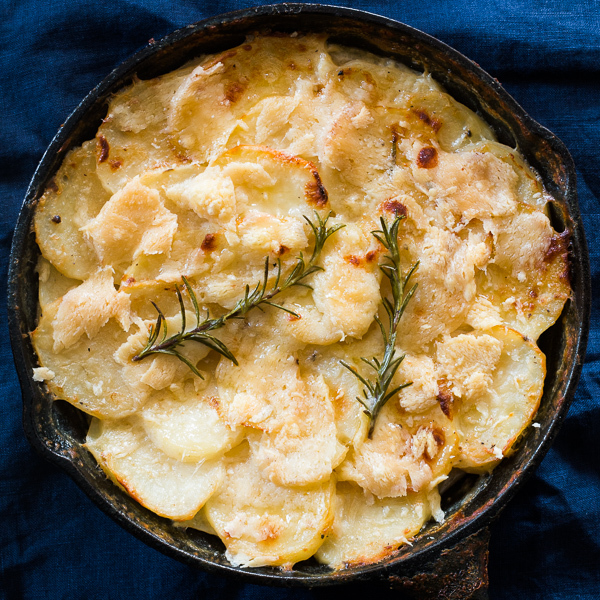 Creamy Rosemary Potato Au Gratin is going to be the death of me one day. Because once I make them I can’t stop eating them. Because how can you go wrong with cream, cheese and potatoes. Add some rosemary, salt and pepper and you’ve got perfection! These creamy potatoes always find a way to the dinner table on big holidays and occasions for us. Every year we complain about all the calories in this dish and then every year we find a reason to make it again. Now by the looks of it, you might think that it’s going to take your hours to slice those potatoes, but if you have a mandolin on hand, which you absolutely should, slicing these potatoes into the perfect slices should be a matter of minutes. I’m not exaggerating when I say that it took me all of 15 minutes to put this together. The rest is just baking time, and at the end of it, you get the creamiest, most delicious potatoes you’ve ever had! I hope you give this a try and do let us know what you think in the comments section below! In a pan, warm butter and oil and add garlic, rosemary and cream. Bring this to a slow simmer and switch off the flame. Fish out the rosemary sprigs and discard. Using a mandolin, slice the potatoes into 1/8 cm thickness. 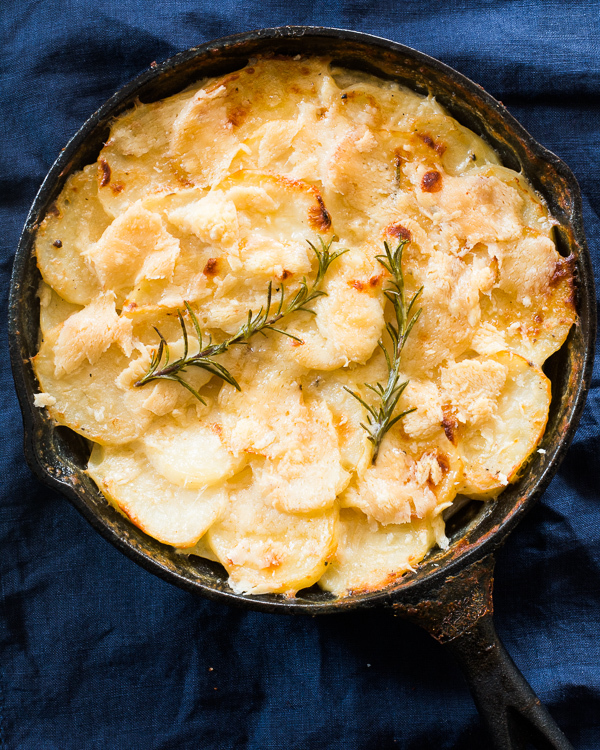 Brush a 10 inch round skillet or baking dish with butter and layer the potatoes in a circle in such a way that they slightly overlap each other. Sprinkle with salt, pepper and 1/3 parmesan and pour 1/2 a cup of the cream mixture. Repeat this till you have 3 layers of potatoes. Cover loosely with foil and bake for 45 minutes. Remove the foil and bake for a further 10 minutes till the top is golden brown. Let it rest for 10 minutes before serving.